The actual magnitude of what took place last week, the Federal Reserve's decision not to taper its current $85 billion per month QE program, is very small. After all, what is the difference between $75 billion, $80 billion, or $85 billion per month of U.S. government debt and mortgages being purchased every month in a $16 trillion economy? Very little. The real importance comes from the market's perception of what it means for the Fed's future movements. Many analysts throughout the country that have bought into the artificial "recovery," felt that the small taper would be a sign that the Fed had finally begun its exit program. Before moving forward, let's briefly define what exit strategy actually means. Back in early 2009 when the Fed announced its first QE program (QE 0 occurred during the fall of 2008 during the panic when the Fed was backstopping everything in the markets), the Fed concurrently discussed the much touted exit strategy saying that when the crisis period had passed they would not only stop buying assets; they would sell them back into the market. This process would normalize their balance sheet back down to pre-financial crisis levels. 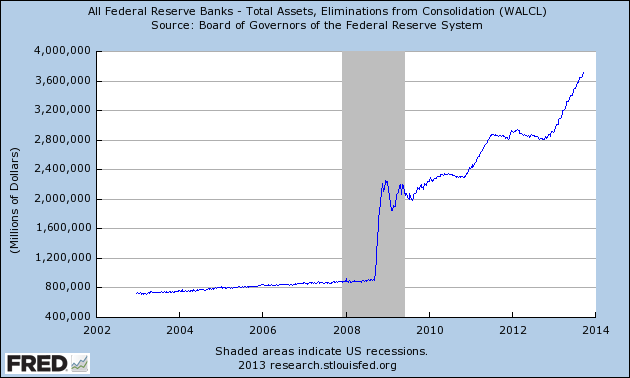 Here is a quick look at the Fed's balance sheet growth from 2003 ($720 billion) to August 2008 ($900 billion). I remember people discussing at the time how this rapid growth was troublesome. 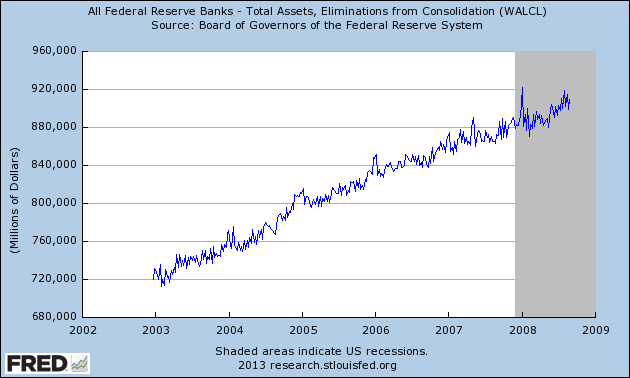 The next graph shows the Fed's balance sheet today. 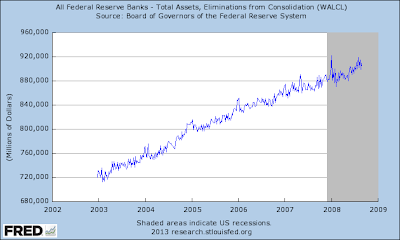 Instead of selling the original assets back into the market to get back down to the $900 billion level (this was being discussed relentlessly by the Fed throughout 2009 and 2010 - I am not making this up), the balance sheet has mushroomed up to over $3.6 trillion. 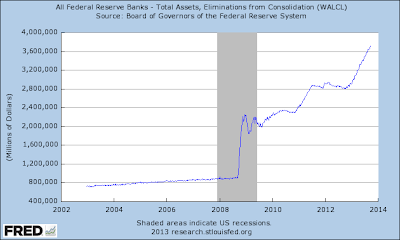 What would occur if the Fed were to "exit" and sell $2.7 trillion of assets into a market where they are the only buyer? I'll leave that up to your imagination. Those with a firm understanding of the financial markets know that what has taken place since early 2009 and the current world will live in today is a complete (and temporary) fantasy. Thus far into the Fed's programs we have only experienced the positive effects of the relentless QE heroine drip: the initial high. 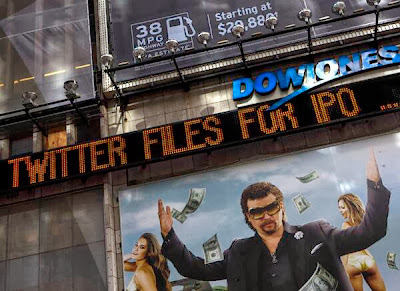 Stock markets have surged to new record highs, with technology IPO's now once again entering the market and doubling the first day (remember 1999?). 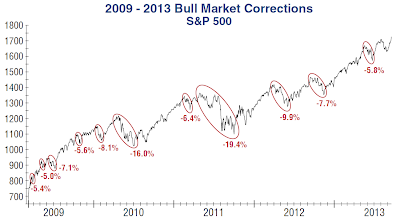 Any correction along the way has been instantly met with Fed talk of more stimulus. This is now known as the "Bernanke Put." The bond markets have taken the bait and yields fell to the lowest levels in American history, before rising the second half of this year (rates are still incredibly low). 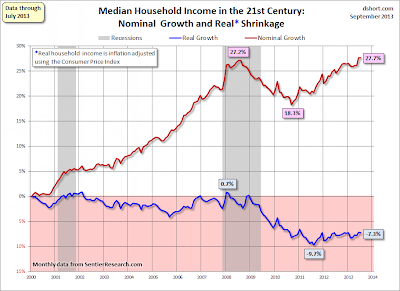 Real estate investors, and to a smaller degree actual home owners, have also taken the bait. 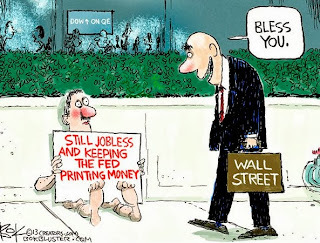 Wall Street has entered the markets with the Fed's free money to purchase thousands of homes. Regular home buyers are beginning to come off the sidelines and take advantage of the low cost of a monthly mortgage. When the Fed tried to calm the market euphoria back in May with the "taper talk" the markets around the world went into a convulsion. Emerging markets were rocked as they felt there would be less printed capital flooding off the shores of America into their booming asset markets. Asset markets within the United States revolted, as stocks and bonds sold off simultaneously. 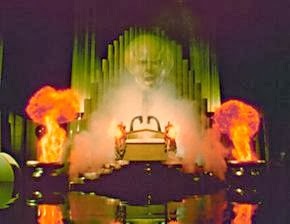 Understanding that a rise in rates, a falling stock market, and a reversal of the new real estate bubble would remove the artificial recovery cloth that has been placed over the eyes of the many, the Fed panicked last week and announced that the taper was off. It is pointless to spend time arguing over why it occurred when you understand the bigger picture; the Fed has painted itself into a corner and is now trapped. The markets today still believe that the Fed has complete control over asset prices, but this belief is completely false. As a perfect example, the 10 year treasury yield was under 1.5% during the summer of 2012 and has since doubled during the QE forever program announced just a few months later. When the Fed does lose control over the equity, bond, or currency market, one of which will ultimately break, it will be chaos in the markets. The only thing holding them together at this moment is misguided belief and confidence. 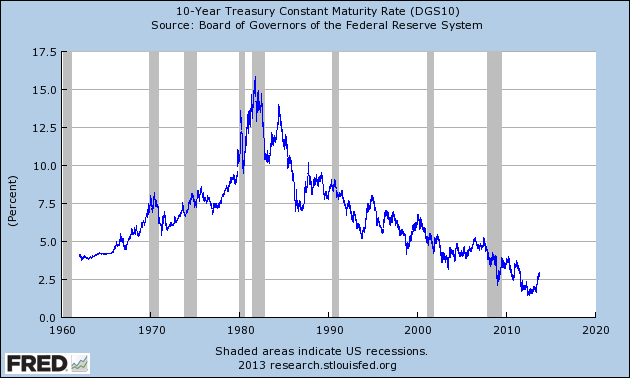 Why will the Fed ultimately lose control? The Fed's asset purchases, on a fundamental basis, are negative for the asset classes that are rising. Most market participants don't remember this today, but back in the 1970's when the Fed's balance sheet was announced, a rise in the money supply would create a sell-off in the bond market. That is the exact opposite of what occurs today. Why? The Fed printing money and purchasing bonds dilutes the value of the underlying currency that the bonds are denominated in. That means you will be paid back in the future with dollars that are worth less today. Since you are purchasing a future income stream this is the only thing that should fundamentally matter when making the investment decision. Today this simple concept has been completely lost, mainly because bonds today are bought and held to flip for capital gains, not an income stream. This is identical to the mindset that entered the real estate market during the mid 2000's. Investors cared little about future income streams because they could always sell the asset tomorrow at a higher price and exit the market. The same thought process is used today with stocks. Investors only see that printed money entering the financial system is new money available to purchase stocks. 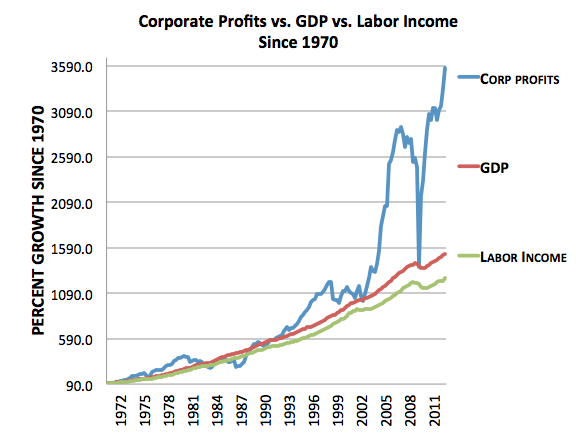 They do not see that new money causes negative impacts on one side of the balance sheet of those same companies (cost to create their goods), at the same time diluting the purchasing power of the consumers who purchase those goods. 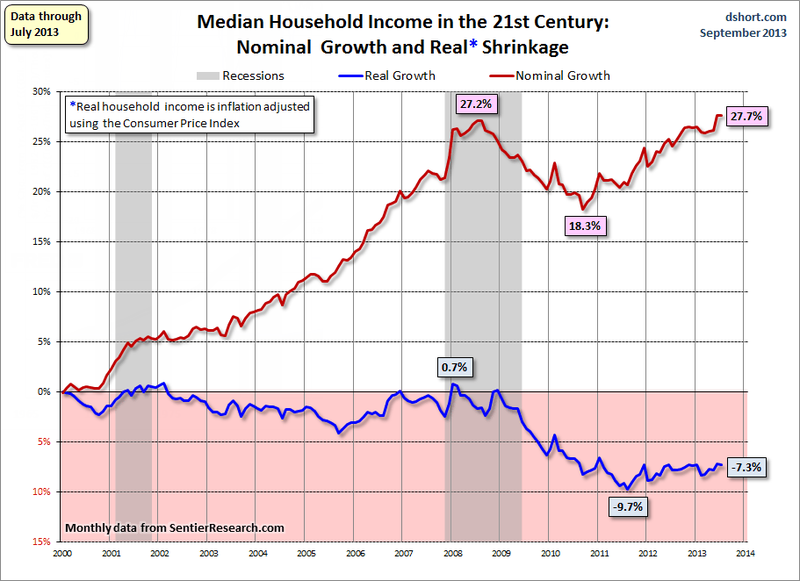 The following graph (blue line) shows that the real median household income (adjusted for inflation) in America since 2000 has fallen 7.3%. 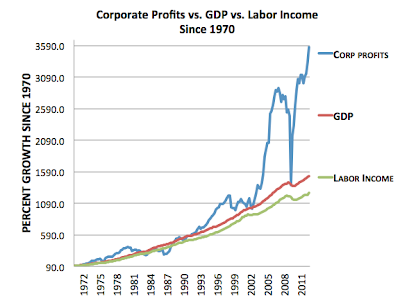 With corporate profits at all time record highs (corporate profits always mean revert), investors are betting on price to earnings multiple expansions to create future gains. 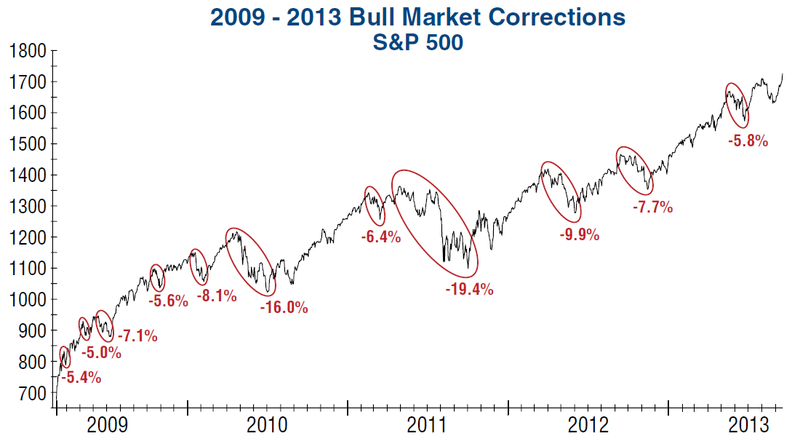 Investors buying stocks today know (hope?) that they can just sell them tomorrow at a higher price because investors will continue to pay more for the same (or lower) profit stream. The Fed has stretched this fantasy so far, like a rubber band expanding or a beach ball being held under the water, that we are close to the point where the markets will mean revert to wash out the mal-investments that have been created. By close, I mean it's likely that point could occur within the next 18 months. Bubbles have a tendency to go on far longer than rational market participants can imagine, and we are currently in the largest financial bubble in history - by far. We have a stock bubble (fueled again by record setting margin debt), a real estate bubble (prices rising due to artificially low interest rates, temporary Wall Street money, and not rising incomes), and a bond bubble which dwarfs the first two in size and magnitude. Everyone is once again moving to the point where they are "all in." Every day that these asset prices move higher provides another layer of fear that is removed from market participants. The concept of holding cash is not only not considered today, it is laughed at. The idea of holding commodities such as precious metals and agriculture is even more obscene. One of the best sayings in the financial markets is that "the bull climbs up the stairs and the bear jumps out the window." While we have seen a slow and steady rise for over 5 years, the reversion of this artificial market could occur in a matter of weeks. In the meantime, as asset prices continue to go higher and higher as the Fed pumps and pumps, fundamental concepts such as the ones you are reading here today will continue to seem more and more crazy. For those that do understand what is coming and have taken action to protect yourself, I congratulate you. You will be able to watch the horror unfold from the sidelines and hopefully have the courage to take action when fear is at its peak. That time is coming. Tuna, your advice is to hold cash right now? How would this correspond to inflation? Do you perceive an upcoming deflationary cycle? 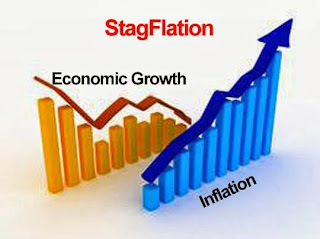 While it's very possible that a currency crisis could break out at any time (my guess is Japan before the United States) making it important that at least a small portion of a portfolio is insurance protected with hard assets, I think the US markets will experience one more deflationary downdraft before the "final" QE comes. I purchase specific assets from a shopping list that I particularly like when they go on sale, but in general safety (cash) is king right now. How much you hold depends on your specific investment goals, age, etc., but I believe being 100% stocks and bonds at the present moment is very dangerous. Tuna, what are your thoughts on bank confiscations on depositors' accounts, much like what has happened in Cyprus? Do you see this happening globally in the near future? Thank you for this blog. It's high quality. I agree with your sentiments about holding cash. Do you feel that money market accounts in banks/credit unions or with brokerages would be at risk during a correction in the bond market?